The door closes. They are gone. That part of your life is now in the past, and the one you loved is yours no more. Sometimes, a break-up will be filled with immediate relief (mostly, it will be filled with sadness) but this scenario has the potential to tear your heart from your chest and leave you with a void in your core that you have no idea how to fill. If you’re still in love when you break up, the pain experienced is set to be off the scale. The world around you crumbles and you are left with nothing but emptiness. You keep breathing, and that’s about the best that you can offer life today. You keep going and you hope that one day soon the pain will lessen. You take comfort in the old age adage “time heals” and you live waiting for that day to arrive. The pain suffered during heartbreak can cause you to become clouded, where restless hands maybe start using social media to look at your ex’s profile; you might send texts you wish you hadn’t, or maybe even find yourself driving the “long route” home to go past their house and see if they’re in. Countless relationships have ended in a situation where people claim their ex has gone “crazy” through paying unwanted attention, and many restraining orders are dished out for this very reason – but is this kind of behaviour really irrational, or is it rather a symptom of the restlessness described in the Celestine Prophecy’s First Insight? In co-dependent relationships, we draw energy from our partner and they are the air beneath our wings. They make us smile, they lift us up, our vibrational energy elevates when we’re with them. We want to be lavished with attention by someone who adores us and allows us to do the same to them – this provides a cure to the restless energy that the First Insight describes. It gives you focus and a reason to live. Love satisfies your being. Before the relationship you felt lost – during the relationship you felt you’d found what you’d been searching for – when you were together you felt complete. In this situation, we are not acting as a vessel which conducts the divine energy, we are a human being, living in a five-sensed world and we are pouring our energy into the other person. If that relationship ends, your energy falls and you have no idea how you can pull yourself back up. Your energy source is gone. Crying is a natural reaction, so don’t hold the tears back; let them flow consciously releasing the sadness that you feel. But as you cry, be aware of the Control Dramas that lie in wait for these moments – the Poor Me, that will allow you to wallow in despair, or the Intimidator, who may want to react aggressively in some way. Use every morsel of energy you have to centre yourself. 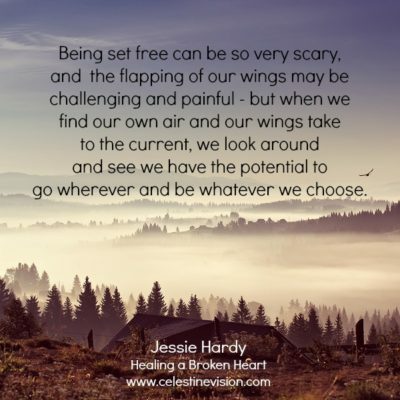 Truly accepting where you’re at and ceasing to fight your inner dialogue with notions of “how things could be” will be your first step in the healing process. Use the opportunity that you have, right now, to focus on YOU. Living in the now, they are not with you – but you are. Choose to be your own best friend. If your friend had just lost their love, would you sit with them encouraging them to reminisce about past times and suggest you look at photos of their ex? I highly doubt it. When you are nursing a broken heart, use your time productively to think about the highest version of you. What do you love doing most? What is your favorite creative outlet? Start doing it more and just for you – it’s surely a nicer way to spend your time than focusing on how much you miss your ex.